The CRISPR (clustered regularly interspaced short palindromic repeats) acronym refers to prokaryotic DNA segments containing short repeated sequences. The expression CRISPR/Cas refers to a prokaryotic immune system conferring a genetic resistance to foreign elements. 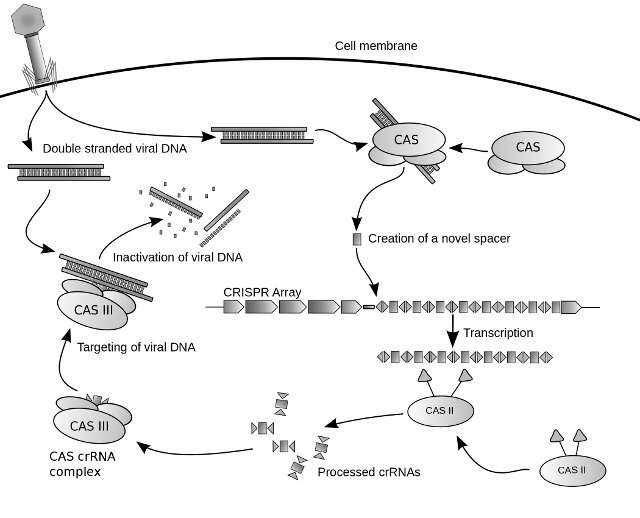 The CRISPR/Cas system is used in genetic engineering, in particular using the Cas9 (CRISPR associated protein 9) enzyme, that evolved in bacteria of the species Streptococcus pyogenes as part of their immune system. The CRISPR-Cas9 has been already used in genetic engineering for a couple of years but progress in this field can be very fast. Feng Zhang, a pioneer of its use, has studied various bacteria discovering an enzyme better than Cas9. Two promising candidates were found in species of bacteria belonging to the Acidaminococcus genus and the Lachnospiraceae family and were called Cpf1. The Cpf1 enzyme seems better than Cas9 in various ways that could allow to make a significant step forward in the field of genetic engineering. It only requires an RNA molecule to cut DNA while the Cas9 requires two. The Cpf1 can cut the two strands of DNA in two different places while the Cas9 cuts them in the same place so the Cpf1 offers more options in selecting the site to be cut. Essentially, the Cpf1 enzyme can allow a more precise DNA editing with greater flexibility in choosing the site do do them. This possibility opens the door not only to the creation of better GMOs but also to genetic therapies to eliminate some kinds of diseases. Genetic engineering and GMOs are always hot topics. There are many ethical implications but also political and ideological components that make it difficult any discussion on these subjects. As a matter of facts, once a technology is discovered it’s impossible to bury it and someone will use it. In December, there will be an international meeting in Washington to discuss these scientific developments. It will be an opportunity to present in a transparent manner the results of these genetic studies. It’s the best thing to do to look for real progress instead of burying our heads in the sand. Previous Post: Happy birthday Scottie Pippen!